Oh, friends. It’s finally happened: I don’t have a photo to share with you today. Yesterday was busy busy busy. I celebrated my first Jewish holiday (assuming the childhood Hanukkah celebrations I held with my dolls and a bee-yoo-ti-ful clay menorah don’t count) at a Rosh Hashanah dinner with S’s extended family. 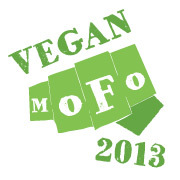 Since we knew there wouldn’t be much vegan-friendly fare, we took matters into our own hands. We brought kugel (super yummy; and yes, you can cut down that olive oil measurement by a TON), macaroons (a never-fail recipe), and a mock chopped liver (delicious with flatbread crackers from Whole Foods). We had a nice time, even though S’s six-year-old cousin refused to talk to us and hid in the kitchen the entire night. Kids, eh? Anyway, we also brought agave nectar to stand in for honey, because it’s a tradition to eat sliced apples dipped in honey on Rosh Hashanah. According to some page I read on the internet, eating sweet foods is meant to “express our hope for a sweet new year.” Well, I can surely get behind that! And I’m okay with apples and agave, too. Okay, I lied—there’s a photo for ya. 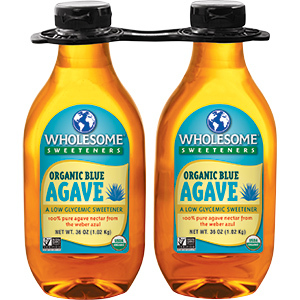 We buy our agave from Costco, and it comes in a big ol’ double pack just like that stock image right there. It lasts foreverrr. Maybe I should start dipping my apples in agave more often. How have you veganized a holiday tradition? Very nice. Hope you had a nice visit and have a great New Year!